James has appeared in more tax cases in New Zealand than any other lawyer. He has appeared in over 140 reported cases ranging from the Privy Council and Supreme Court through to the Taxation Review authority and District court. Tax investigations can be enormously stressful. There is the stress of having to comply with multiple information requests then there is the uncertainty of not knowing what Inland Revenue might do in terms of re-assessing you. James has recently won the leading case on personal tax residency in New Zealand, CIR v Diamond. The win meant that Inland Revenue had to withdraw its then published policy statement and issue a new one. Inland Revenue is increasingly auditing the hidden economy. In particular they are targeting the hospitality and construction sectors. These investigations can lead to large tax debts. Some of the latest cases James has argued are listed below. For most people litigation is a once in a life time event. Wisdom, integrity and experience are vital. He has spent 10 years writing a tax column for the New Zealand Law journal and he also writes for taxation today and for the Thompson Reuters NZ publication New Zealand Taxation Principals, Cases & Questions 2016. James is also a teaching fellow at the University of Auckland Law School. He teaches as part of the Masters of Taxation course. 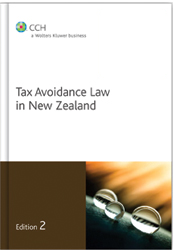 James is the author of a text book on Tax Avoidance Law in New Zealand, which is currently in its second addition. James comments from time to time on relevant developments. Be in the loop and sign up for his newsletter.